As I was reading The New Spanish Table , I was so excited about the tapas, seafood, and rice chapters, I didn’t really even expect much from desserts. I should have known better. There are ice creams, sorbets, and granitas with flavors ranging from honey and cinnamon to beet and strawberry. 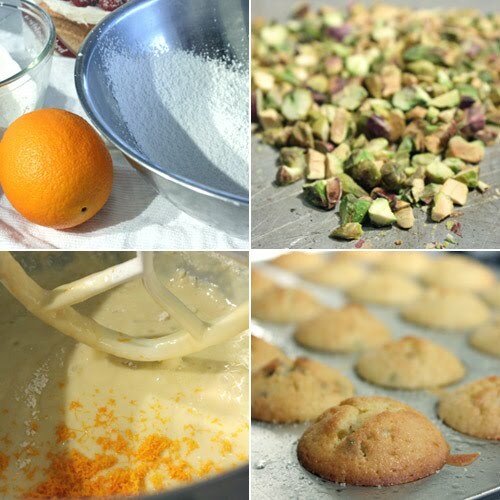 There are also confections and cookies such as the orange and pistachio magdalenas seen here. These light, little, tea cakes are made with olive oil instead of butter and are flavored with orange juice, orange zest, and orange flower water. Something about the fragrance of orange flower water seems like summer to me. Is there a flower that blooms in the summer with a similar scent? 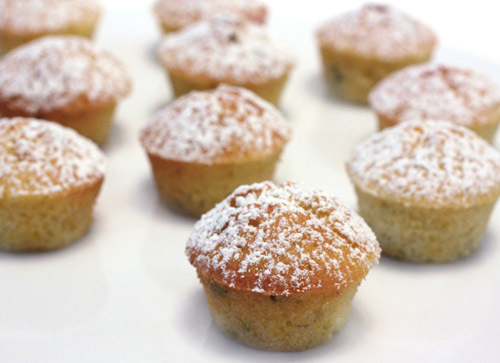 Whatever it is about it, I like it, and it added another dimension to the Moorish-inspired flavors of these delicate, mini cakes. They’re similar to French madeleines but were baked in a mini-muffin pan. The batter was started by mixing eggs and confectioners’ sugar. Then a combination of flour, salt, and baking powder was added alternately with a combination of cream, orange juice, and olive oil. Last, chopped, toasted pistachios, orange zest, and orange flower water were added. The batter was covered and left to rest for 30 minutes before being baked in buttered mini-muffin cups. After the cakes cooled, they were dusted with a sprinkling of confectioners’ sugar. It’s a good thing these are simple to make because they disappear from a serving platter quickly. They’re cute and so light that when you pick up the bite-sized morsels, you quickly lose count of how many you’ve sampled. Since I hid some away to ensure they’d last a few days, I can also report that they keep very well, and the layered orange flavors are perfect with a cup of tea. They look so pretty anad delicious! Nice flavors! These look so good! My mouth is watering. The fact that this little cake is using olive oil instead of butter is what I find intriguing. Hope you had a wonderful Easter. They look perfect and love the flavours in them. The citrus trees are in full bloom here in Greece and the streets of Athens are full with citrus trees and it smells heavenly. My mother used to make blossom water. Stunning magdalenas! You know, it's not that easy that they rise so beautifully, well done! Everything about these magdalenas sounds wonderful! They would be so perfect for an evening cup of tea when a dessert and coffee are a bit too much. A recipe to try! Thank you for sharing. I think I know what I am going to bake next time! THese magdalenas look so beautiful and delicious. things to love: the unique combination of tangy orange and salty pistachio, the delicate crumb, the baby size. what a lovely little dessert! The medeleines look so moist. The pistachios are definitely a plus. Great recipe. These are just perfect with tea. The cakes look so lovely! 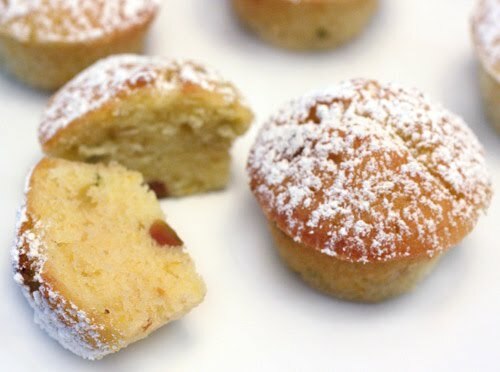 Very pretty and sound so delicious with pistachios, perfect little cakes! These looks just so cute...and edible! Love the powdered sugar on top! Orange and pistachios? Love the subtle combinations. I would LOVE to have one of these right now, with the cup of coffee I'm sipping right now. Olive oil and orange always makes the best deal and the pistachios with them are a bonus. I am having coffee now and I so wish I could have a couple of these cuties with my coffee. The orange flower water is divine! I love that these are made with olive oil. And the flavor and aroma of them sounds so inviting. Their gorgeous! Oh my, they do look like bits of perfection with the orange and pistachio combo. Must try soon! Love the flavours and they look so good, Lisa. So are madeleines in muffin tins magdalenas? Hearing of them for the first time. I think there's a simple word to describe my reaction to these: Want.